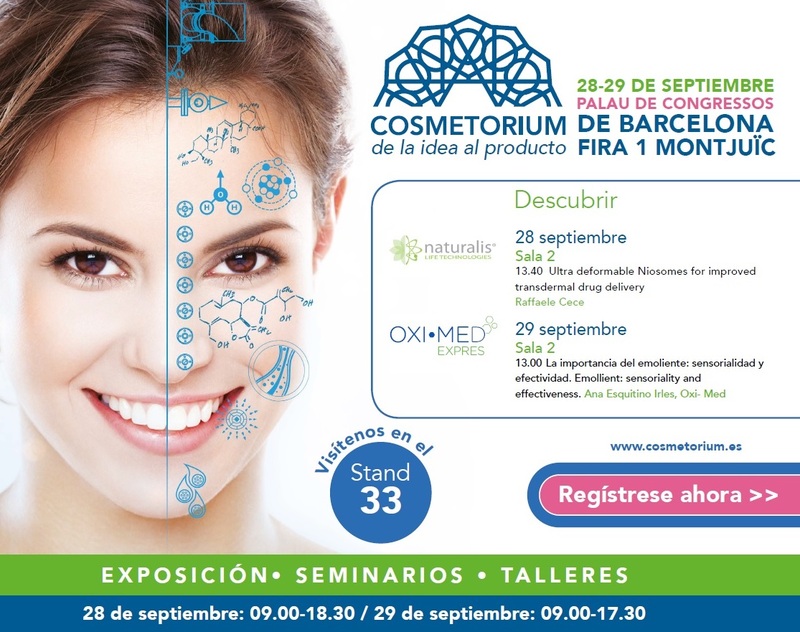 Oxi-Med will attend the Cosmetorium exhibit that will be held in Barcelona on 28 and 29 September. We will be a Stand 33. 29 September – 13.00 to 13.20 (Room 2) “The importance of emollient: Sensorial qualities and effectivenes”, organised by Ana Esquitino. transdermal drug delivery", a cargo de Dr.Raffaele Cece – Managing Director de nuestra representada Naturalis. Cosmetorium has been devised with the aim of establishing a complete forum on the formulation, manufacture and distribution of cosmetic products, responding to the needs of professionals in the sector and highlighting the importance of Spain as a centre of excellence in the cosmetics industry.